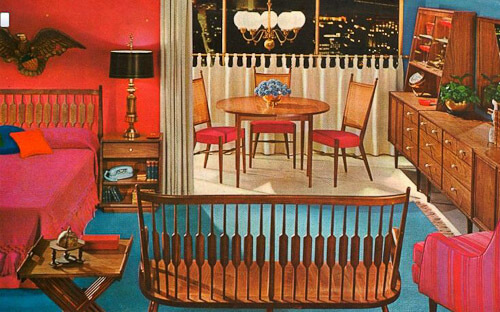 What are the most collectible brands of vintage furniture? You know that’s an impossible question, because it’s different strokes for different folks — and different budgets, too. But to get the conversation started, Pam and I brainstormed a top 10 list of our favorite vintage furniture — some of which we own and some, we dream about. 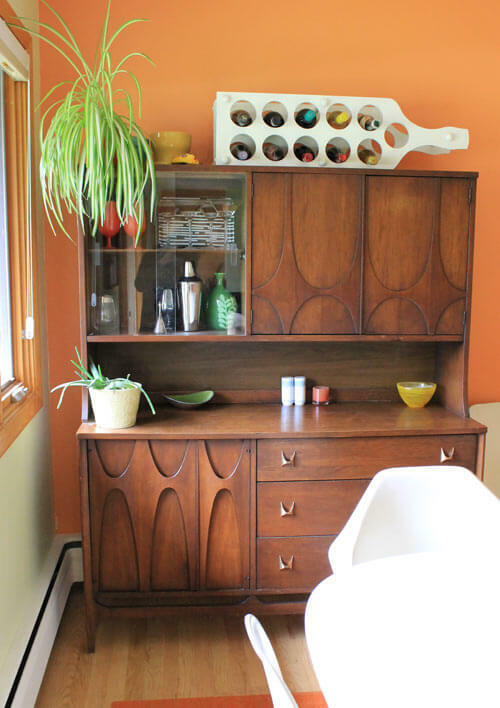 Read on… then, we want to hear about your favorite vintage furniture designs, too! I’m sure that many of you are like Pam and me when it comes to vintage furniture — so enamored with it, that suddenly the house is full to the brim — and still you want more. Why wouldn’t it be this way? Vintage furniture is — for the most part — very well constructed, with quality wood constructions, and with exciting designs. Vintage furniture was built to last, which means a lot of it — especially case goods (pieces made of wood like dressers, hutches, desks, shelving and dining chairs) — are desirable because they are still in like-new condition today after 50 or more years of daily use. 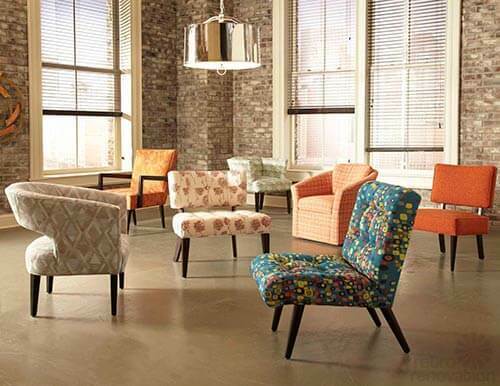 Even upholstered pieces like easy chairs and couches — which may need costly reupholstering — are still in demand due to their solid frame construction. Vintage furniture also tends to be very affordable, compared to buying new. Pam says: Vintage dining room sets and bedroom sets, in particular, can be spectacular deals. That’s because: While you can collect an almost infinite number of vintage decorative items (paintings, ceramics, glass, any kind of collectible…), you really only have space for one dining room set and two or three bedrooms sets. So, basic laws of supply and demand mean these larger items, which are harder for sellers to move (pun), are often great bargains. As much as I would like to rescue every piece I come across, my husband has decided that we will not buy any more vintage furniture unless we have a designated place for it — which at this point for me means one piece in, one piece out. This has made me try to concentrate on acquiring only the pieces that I really love and letting the rest go live at some other vintage furniture nut… errr, connoisseur’s… house. Broyhill made some great furniture lines in the 60s, and one of the most popular vintage lines today is Broyhill Brasilia line, which launched in 1962. The appeal of this line is the fantastic swooping designs that help give the line its instantly recognizable character. These decorative details are based on the architecture of Oscar Niemeyer, who designed Brazil’s modernist capital city, Brasilia. I have eight pieces of Brasilia in my home and I love them all just as much as the day I bought them. 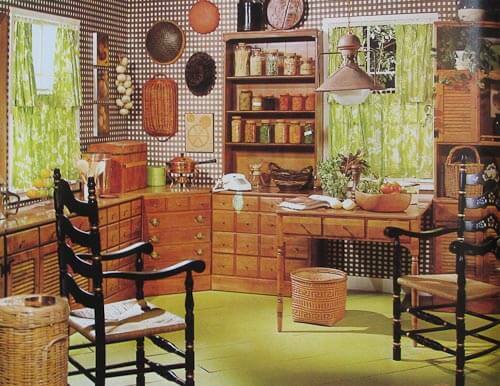 See this story –> for link to an original sales brochure for Broyhill Brasilia — pretty cool! Pam here: I am adding the bullets. And confessing: My main research go-to on these Broyhill lines is now Furnish Me Vintage — what an awesome archive Jackie and Todd have! xoxo, you two ROCK. The curving lines, solid wood construction, and unique champagne finish of Heywood-Wakefield furniture has made it one of the most popular vintage furniture styles of all time. Vintage HeyWake is still pretty abundant, and great deals can be found. But did you know that Heywood-Wakefield furniture is still manufactured today, right here in the USA. 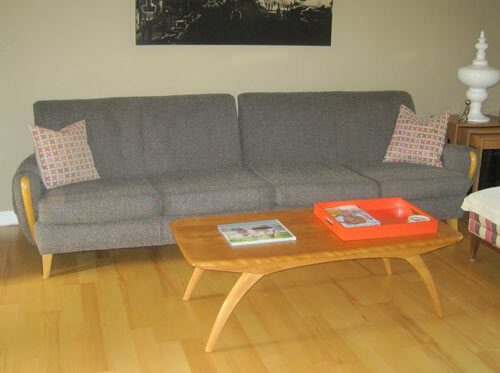 Above: Cindy’s Heywood-Wakefield couch and coffee table — from 306 photos of reader living rooms. And to see a piece of new Hey-Wake, read here about Betty Crafter’s new Heywood-Wakefield king-sized bed. 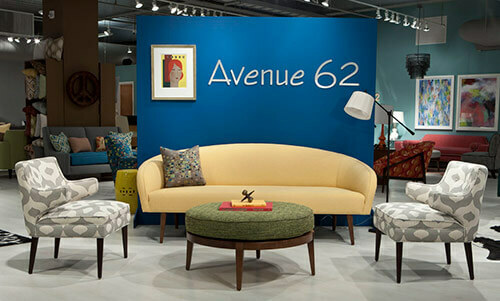 Drexel Declaration is one of the first vintage furniture lines ever profiled on Retro Renovation. Pam even talked personally to designer Stewart MacDougall about the genesis of the line. In addition to having a clear modern aesthetic, Drexel Declaration also harkens to Shaker furniture and the Shakers’ desire that the construction details of furniture be visible. This is a brilliant design, because it appeals to modernists and traditionalists, alike. We have a vintage Drexel Declaration catalog archived here on Retro Renovation. Again, Furnish Me Vintage has a terrific archive. If you are a fan of flower power decorating, look no further than Drexel’s Plus One line — made in the 1970s. This is a favorite of Pam’s — which she revealed in her post about the Drexel Plus One line — calling it, “The most fabulous bedroom set ever made — no doubt about it.” Yes, there is no doubt that this line has attitude and humor with its labeling of the obvious. I wonder what happens if you store your Tuesday clothes in the Friday drawer? 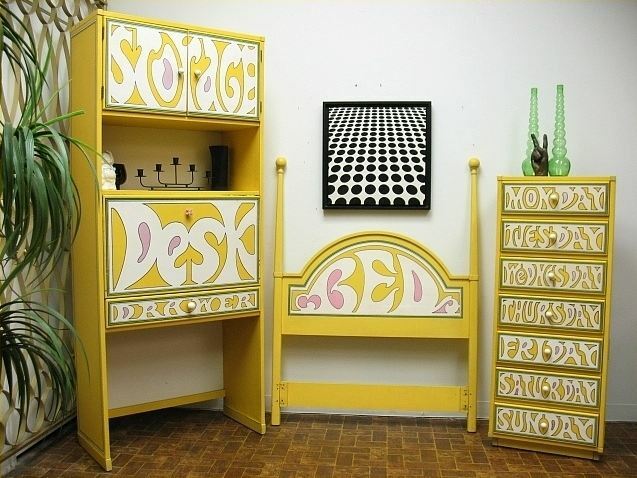 Above: Drexel Plus One bedroom set, courtesy of sellers Smugglers Cove Vintage. When you are trying to decorate a retro living room — in any style from grandma’s house to retro atomic — it is hard to go wrong with a Kroehler sofa. They were made with such range of color, shape and size and often upholstered with frieze fabric that holds up extremely well to wear and is VERY expensive to purchase today — if you can find it. 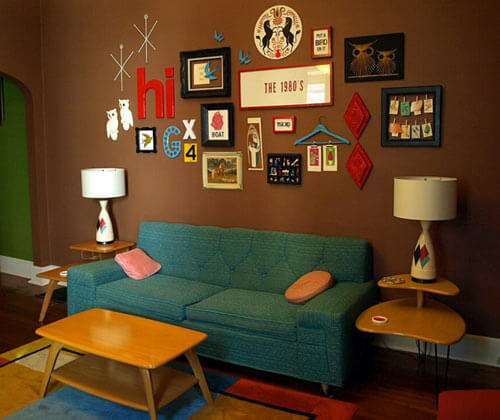 Check out Michael’s 1958 Kroehler Decorating Aids — pretty cool. Above: Kristin’s Kroehler sofa — from 306 reader living rooms. The crisp, graphic look of Eero Saarinen’s iconic tulip tables and chairs will be forever appealing — even if you don’t use these in your decorating, it is hard to frown when you see them. 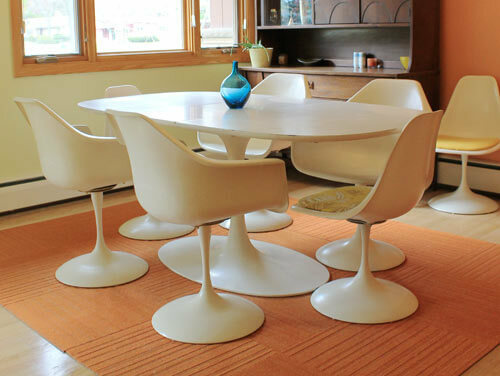 Authentic Saarinen pieces can be extremely expensive and therefore not a reality for most to own, but it is possible to get the look for less by searching out more affordable vintage copies made by companies such as Burke or Fiberform. Pam found and restored her Burke tulip kitchen table set. Above: I own a Burke dining room table and Fiberform chairs. Pam says that another of her favorite, mid century furniture makers is Ethan Allen. In particular, she loves the Custom Room Plan furniture suites marketed widely in the 1970s. Maybe in the 60s and into the 80s, too? We’re not sure. The photo above is from one of Pam’s 1976 Ethan Allen catalogs. The idea with the Custom Room Plan pieces was that they were modular — you could mix and match them to create an almost infinite number of designs in virtually any room in the house. As you can see, the aesthetic was Early American — but the idea was totally modern, in keeping with growing families movin’ on up from small ranches to larger split levels. You can see some more Custom Room Plan furniture from 1974 in this story, including some French Provincial door styles. Pam also is a fan of Ethan Allen girl’s bedroom sets with canopy beds (she was deprived), and of upholstered wing chairs and the like. Much of this furniture was excellent quality. Get your head around the less-fashionable (today) historic revival styles, and you can find yourself some sweet bargains. 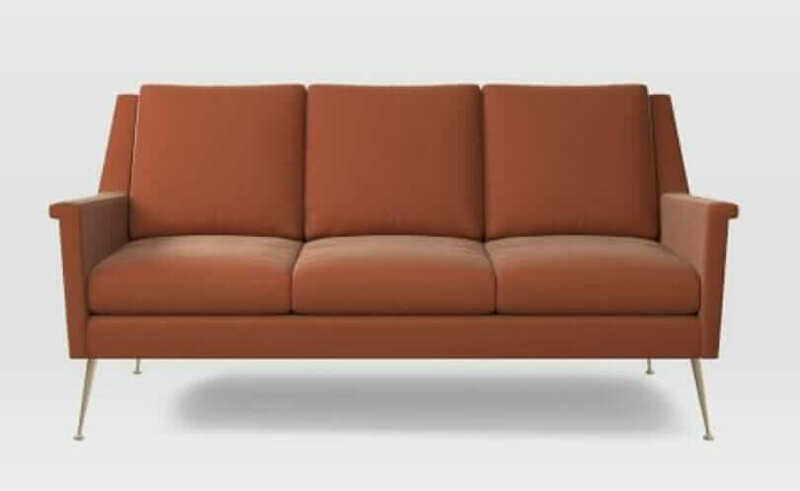 Known for his daring designs which brought high style to the masses, he is credited with the creation of long and low gondola sofas, free-form walnut and glass tables, and the popularization of the venerable bean bag chair. Don’t be like Pam and let a Pearsall treasure-bargain slip through your fingers: Get to know all the pieces by studying this vintage catalog of Adrian Pearsall Craft Associates furniture designs. 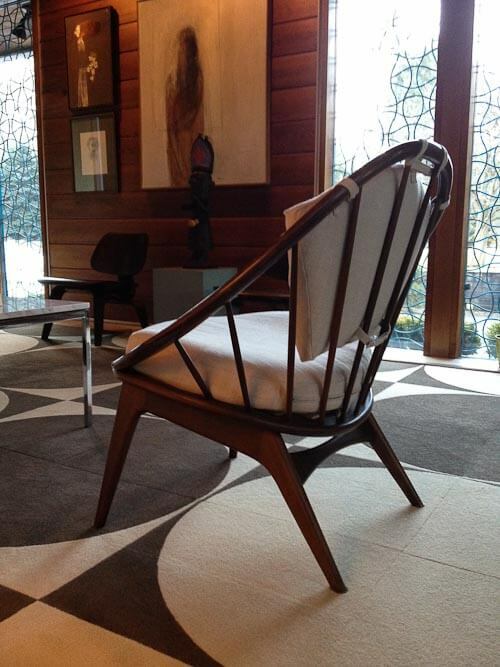 Okay, so the name Kofod-Larsen was not on either my or Pam’s radar until Rochester Steven — of the fabulous Alcoa Aluminum house featured several times here on Retro Renovation — sent in the photo of the pair of the new, vintage chair he recently scored for his place. They are Kofod-Larsen hoop lounge chairs, imported by Selig, he tells us. And as you can sort of see in the photo above, they repeat the circle motif he has going on in his living room. Now, while many of the furniture designs we’ve been showcasing so far today are what we would still call “affordable” — that is, you may still be able to find them as relative “bargains” because they were mass marketed — chairs like these Kofod Larsens, not so much. 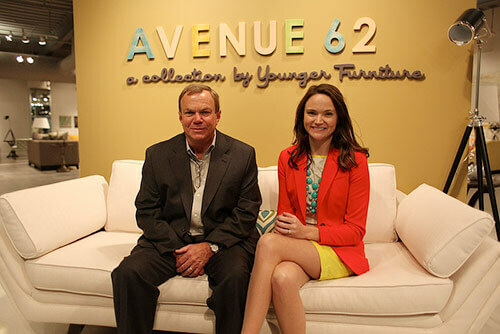 Jackie and Todd at Furnish Me Vintage have a pair of Kofod Larsens recliners for sale for $2,750. Really, though, the point of this entry is that Kofod-Larsen is emblematic — our nod to the scores of other high-end, mid century furniture designs out there for the hunting. We don’t typically talk high-end priced stuff here on Retro Renovation, mostly because: We ain’t that rich. We don’t shop high end, so we don’t really know. But, even if you are a bargain hunter, too, you can get yourself educated, and maybe scoop up fantastic super treasures.. Other names to learn about: George Nelson, Marcel Breuer, Vladimir Kagan, Florence Knoll, Warren Platner, Charles and Ray Eames, Isami Noguchi, Edward Wormley, Milo Baughman, Jens Risom, goodness, there are many more, who else? Life would be no fun if we were super serious about our furniture all time, would it? 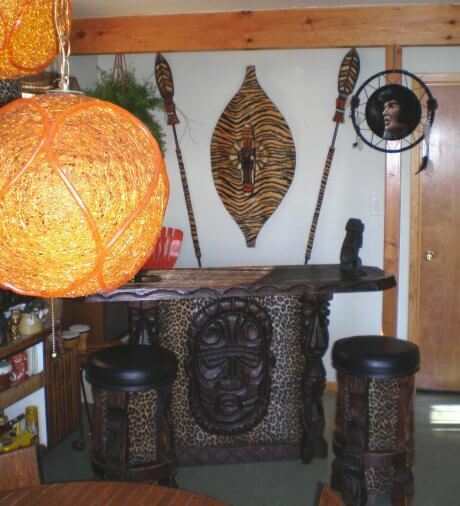 Come on, try and tell us you don’t want to cut decorum loose and have an entire bar stocked with Witco tiki furniture. Pam spotlighted the set above on ebay in 2009, and reader Ghost of Elvis bought it. We haven’t heard much from Ghost of Elvis for a couple of years. Pam thinks he is having too much fun mixing mai tais. And who can blame him. We try and stay on Witco patrol here at RR — see our archive for photos of elusive wall panels, thunder god chairs and the all-time favorite Witco tiki map of the world. Oh yeah, if we expand to a list of 25, whiskey barrel furniture’s also going on the list, yes sirree. 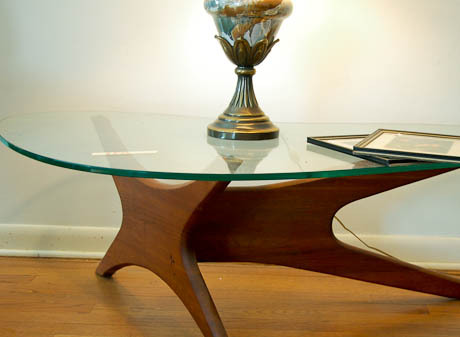 If we expand the list to the top 25 vintage furniture designs — which pieces would you add? Do you love them because you own them or are they your dream furniture pieces? Note: This is not a buying, selling or valuation site. All such comments will not be approved. France & Son as well as Ray and Charles Eames would top my list. I purchased a 1952 “rancher” in Sacramento CA. It’s a pretty plain rectangular box, not a lot of “mid-mod” to it but I’m interested in staying in the time period. I’m looking at the dining room and wondering what to look at for a china cabinet. I could have cabinets built in – did these houses have built-in cabinets and what did they look like? I have a pretty long wall – looking at china cabinets, I’d probably need two. (Chances of finding vintage matching china cabinets seem low.) I don’t need to be matchy-matchy but I don’t want it to look piece-y either. Most of the china cabinets I have looked at on line are from the 1960’s (or 193’s) – not much from 50’s. Are 1950’s cabinets hard to find? I could go ’30’s – after all, a lot of people must have brought existing furniture with them when they moved to a new ’50s home. I’ll be getting a new table too. Refinish old furniture to its former glory — or have fun with paint? We have LOTS more stories about sofas -- old and new. Click here to see them all!